Christmas is a magic time, especially when love is all around and the Mother Lode hosts five weddings and a family celebration. Cory never expected to run Baker’s Secret Hideaway, but when she needs help, Dex Trenton enters her life in more ways than one. Chris Day isn’t looking forward to Christmas. But injured skier Raven Chase lands in Red Rock Clinic on Christmas Eve, and her holiday plans change. All Noelle McGregor wants is real mistletoe her first Christmas without family, but getting it leads to literally falling for Matt Spicer. Sonata Sullivan returns home where she encounters her widowed high school boyfriend, Tommy Henderson. But her heart belongs to Jamali in Morocco. Posing as tourists, Sara Hayden and Gretchen Dodge meet Swedish businessman Thad Johansson. When he returns unexpectedly, will their deception be discovered? Christmas is the magical time of the year and what better place to be then in Colorado with the majestic snow covered Rocky Mountains as a backdrop and snow covered streets and Christmas weddings. 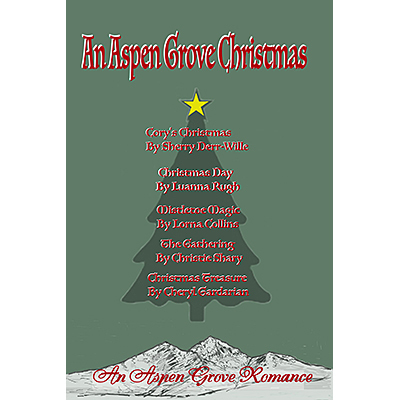 In their newest anthology “An Aspen Grove Christmas” four well know authors have come together again with a new addition to the writing group. “Cory’s Christmas” finds Cory Baker on leave from her nursing duties to help run his Bed and Breakfast. With the death of his wife earlier to his injuries suffered in an accident it looks like her career has now changed. When Dex Trenton enters the picture he not only works for the B&B but in Cory’s life also. 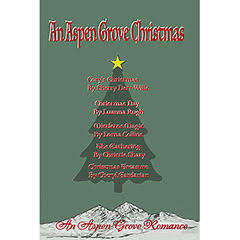 “Christmas (Rose) Day” is not looking for a husband or a boyfriend as a matter of fact, that is until Raven Chase lands practically in her lap. Injured in a skiing accident there was only one place for him to stay. Her place. Not only does she celebrate Christmas with him but her birthday also. From “Mistletoe Magic” where all Noelle McGregor wants is a bunch of fresh mistletoe to falling at the feet of one of her favorite writers to “The Gathering” finding Sonata Sullivan returning to Aspen Grove after years of working with UNICEF, to meeting an old lost love from years earlier. Ending the book with “Christmas Treasures” Sara Hayden and Gretchen pose as tourist after meeting a successful Swedish businessman. When they discover that Thad Johansson is returning how can they hide their deception. After all he’s rich and they just hold down meager jobs. I always look forward to reading any of the anthology’s Sherry Derr-Wilde, Lorna Collins and the others write. They know how to pack a full novel into a short story. To everyone who still believes in the wonder and magic of Christmas--you will enjoy their newest venture. 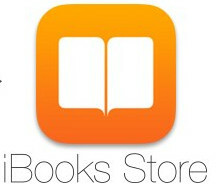 Also you can answert at goodreads website. Question 1: Who is the author introduced in this book? Question 2: What is the Mother Lode? Question 3: Who is the new architect in town? Question 4: Who is the old lady with the big house? Question 5: Which story has two romances in it? Question 6: How many weddings are there at the end of the book? Question 7: Who owns The Mother Lode? Question 8: Who is the famous western writer who lived in Aspen Grove? Submit your answers to us and we’ll let you know if you are right.